The Fire Emblem fanbase is getting fired up for a brand new game in their beloved series, one that promises a world of new features and additions on top of what Awakening introduced three years ago. It wouldn’t be a stretch to call Fire Emblem Fates a sort of Fire Emblem sandbox with the amount of things you can do in it. Build a castle, reproduce, you get the idea. Not that there is anything wrong with that. Fire Emblem Fates is one of my most highly anticipated games of the year, especially after seeing the extensive evolution the series has undergone in recent years. However, each and every little activity piled onto the Fire Emblem formula means that the series is striding further and further from why I first fell in love with it. But first, for those who are too young to remember, we haven’t always been blessed with the chance to play Fire Emblem games. Most Americans weren’t introduced to the series until Super Smash Bros. Melee came around and threw two sword-swinging strangers into our faces. I mean, who the heck are Roy and Prince Marth? Little did we know that Nintendo was sitting on an entire franchise that it had held back on localizing for nearly an entire decade! Two years later, it corrected this mistake by finally bringing the series to the English speaking world, all thanks to the powers of the Game Boy Advance and a little game simply titled Fire Emblem. From there, my outlook on the strategy RPG genre changed forever. You have to realize that by that point, my only real ventures into this genre had been Final Fantasy Tactics, Disgaea: Hour of Darkness, and Final Fantasy Tactics Advance, three games lauded for their infinite levels of customization. Within each games’ parameters, players could essentially create any kind of warrior they desired. Knights with healing magic, ninjas who could wield axes and jump to infinite heights. The possibilities were endless! 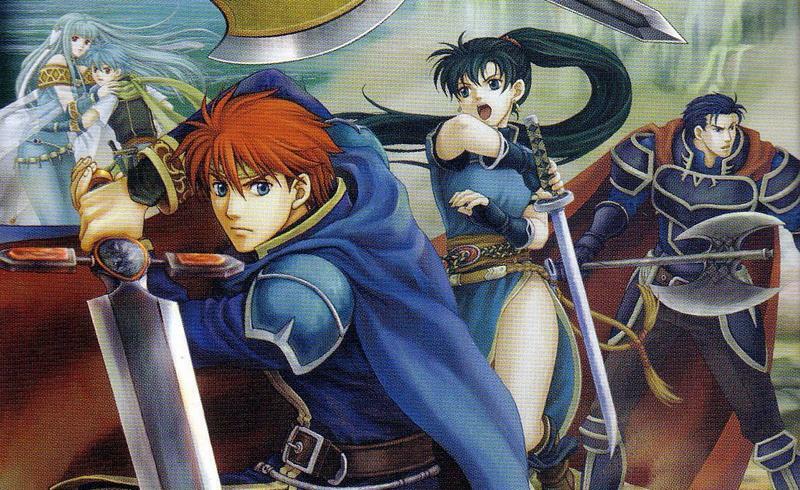 Fire Emblem had no such options, tossing aside customization for accessibility, a simple rock-paper-scissors battle system, and most importantly, the same kind of brisk pacing that sets Suikoden II and Chrono Trigger apart from the JRPG crowd. And for what it’s worth, in a day and age where customization and personalized experiences trump every other aspect of game design, it was these three new elements that still make the Game Boy Advance Fire Emblem relevant today. If memory serves me correctly, I burned myself out on Final Fantasy Tactics Advance, grinding away on countess battles to strengthen my guild to be the strongest in the land. Fire Emblem came around shortly afterwards at just the right time in my life, back when I was getting bogged down with ambitious PlayStation 2 JRPGs that required a level of dedication I simply did not have. I mean, do you know how many classes I had to skip during my freshmen year to keep up with all of my JRPGs?! I was immediately turned on to its speed and accessibility. Jump into a fight, battle through a simple rock-paper-scissors system, and trot on to the next. No dawdling in menus choosing the perfect upgrades. Just equip new weapons and go! Battle, story, battle, story, battle, story, boom, boom, boom. And despite this brevity and lack of options, I was still getting much more out of it emotionally than even the largest of JRPGs at the time like Xenosaga. I’ve lauded Suikoden 2 with this same praise, but for a game that is 20 hours long, Fire Emblem feels like a 20 hour game. No padding, no baggage. You might need to replay a challenging mission a few times, but sliding through its campaign flows as naturally as a game can get. What’s more important to the game’s success, though, is how direct it is. Aside from the occasional optional bonus that might trigger a new character or secret scenario, the game moves in a straight line from mission to mission, the same that players will experience each and every time they play through the game. Blasphemy nowadays, but it works to Fire Emblem’s advantage. The game plays more like Super Mario Bros. than an RPG, asking players to improve and make better choices through practice rather than through grinding until strong enough to overcome a challenge. This singular limitation allows the game to truly shine thanks to limiting the available experience points. In 2003’s Fire Emblem, characters must participate in every battle if they are to be used by the game’s end. If character’s don’t fight, they don’t gain experience, and they quickly fall in value on the roster. Because of this, every attack matters. Every last little experience point has value and every gained level is precious, so that when the final boss trounces onto the map, players have a perfectly tuned and balanced army rather than two or three fatties who soak up all the experience. Its sequel, Fire Emblem: The Sacred Stones, would not follow in this path, opening up the world map to allow an infinite number of random battles. Because of this, players could grind out amazing teams by cutting away wimpy zombies for a few hours, or they could heavily lean on better characters earlier in the game knowing that chances to grind weaker ones are just around the corner. The results are a team that is just as effective, but doesn’t feel nearly as rewarding. Experience in the games following Fire Emblem isn’t earned through trials and tribulations of genuine battle. It’s not achieved by carefully planning out which characters need to get in a hit to gain that next level or which character needs to kill the boss in preparation for the next fight. It’s gained through exploiting a cheap RPG mechanic, taking pot-shots at weaklings for easy experience. The Sacred Stones falls into this trap, and, sadly, the far superior Fire Emblem Awakening does, too. I also get the feeling that this method is proving more popular with fans, and it will continue to dominate Fire Emblem Fates and beyond. That’s not a bad thing. I’m not knocking the games in any way, especially Awakening and Fates which do amazing things with their RPG mechanics. It’s just that this Fire Emblem forced me into situations where I had to divvy up the experience and actually make decisions a tactician would make in that regard. The flow of this game naturally determined how my characters progressed, not stonewalling and fighting pointless battles for hours on end. I guess this means I’m going through the Conquest campaign in the latest game. 2003 Fire Emblem will forever exist as a unique entry in the series, one that will never be replaced by larger, more customizable sequels. Nothing after it comes close to matching the tension of living in the heat of battle, not from the safety of a world map or a menu screen. Apart from this, I like its story the most from the modern games, and Lynn, Lucius, and Oswin are still my three favorite Fire Emblem characters, both to take in battle and to listen to in the cutscenes. This might seem weird, but it does a fabulous job making players feel apart of the story as characters will directly address them, eye contact and everything! Fire Emblem, along with Disgaea, was one of the first games that introduced me to “talking head” cutscenes that have overrun the JRPG genre, and it also is one of the few games I can tolerate them in. They actually have a purpose here, immersing players in the cutscene action, and are not done for mere budgetary reasons. I like how its experience points glitch also poses a risk to your progress, and how even cheating guarantees nothing. This was also my first experience with permadeath, and it opened my eyes as to how important it was to take care in battle. Nobody wants Fire Emblem characters to die, so it’s back to round one if carelessness overruns your train of thought. I also loved the battle animations, noticing that Fire Emblem sported some of the most fluid sprite animations of all time. See above for what I mean! And how about when it’s over?! Another blasphemous claim, but Fire Emblem pulls no punches when wrapping things up. You beat the game, it’s back to the beginning. No New Game+, no post game content, and if you want to relive battles as your favorite killing machines, you’ll have to train them from fledgling units all over again. But most of all, I think I like it the best because it came first. No matter how many Fire Emblem games are released in the future or how many of the older titles I go back and explore on the fan-translation scene, I’m very confident in saying that the 2003 Fire Emblem is always the one I will be going back to or the rest of my days.